Families and high school students will now receive emergency texts from the district. The communications team will also send emergency robo-calls and robo-emails. Messages will be sent during crises such as lockdowns, evacuations and weather delays/closures. We are excited about this change because sending text messages will inform families and students of crises in a much shorter time frame than what it takes for a robo-call or robo-email to be delivered. Families of high school students, please fill out this Google form in order to sign up your student to receive emergency texts:https://goo.gl/forms/eHOkmX8WHQ6gC4Vf1. EGHS students who are 18 or over, may submit the form themselves. Parents and guardians, you have been automatically opted-in to receive emergency texts based on cell phone numbers provided during registration. 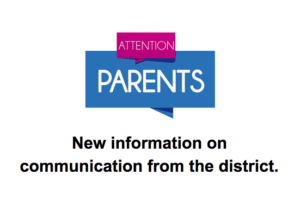 Please check to make sure your information is up-to-date in Parent Portal. Messages will be sent in English and Spanish.